The Puppy Book contains in-depth chapters on grooming, feeding, and veterinary care. It features common-sense advice on how to choose a suitable puppy, and how to raise him to become an outstanding family companion. Extensive chapters help the new owner be successful whether he chooses water work, obedience, draft (carting) work, rally, conformation or tracking. Plus much, much more! 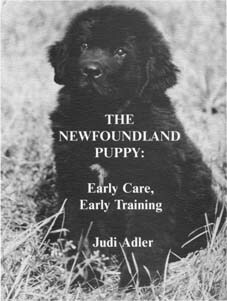 Breeders worldwide have embraced the Newfoundland Puppy book, calling it “the Newfie Bible.” Puppy owners agree that it’s the best book by far for the new (or prospective) puppy owner. We're Bored. What'll We Do Today? Canadian or overseas orders? Multiple book orders? Please email Judi or call her for the correct price. You can then pay by credit card, or send a money order or cashier’s check payable in US funds. Judi has a few copies of the previous edition on hand, at $25.00 each. This is an excellent opportunity for breeders to purchase multiple copies for their new puppy owners at a lower price. Please contact Judi for availability.